If you ask my husband, he would tell you that we did not need one more thing to fill our wall space. Well, he would be wrong! We desperately needed something to fill the odd space above the television in our living room. We use to have a smaller television that hung on the wall, but our current one sits on a low entertainment center. To make things more complicated, our thermostat is located on that wall, so we could not just hang a large piece of framed art there to fill the space. 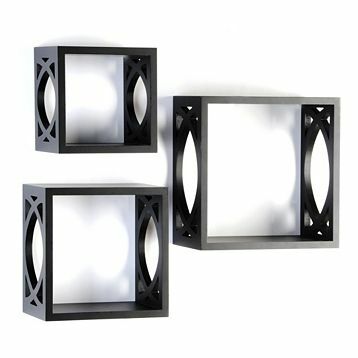 Something modular, like this Set of 3 Lattice Cube Shelves from Kirkland's was the perfect solution. This set of 8", 10", and 12" square shelves are a generous 5" deep. Originally, I was considering just hanging the framed photos of our 3 children on that wall, even though they did not fill the space well. These shelves were a much better fit. It took us awhile to figure out a configuration that felt balanced to us. 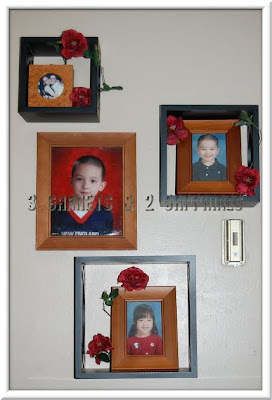 I love displaying our family photos this way because it is much more interesting to the eye than just hanging them flat. This set of shelves came with all the hardware needed to hang them, including anchors. They are pretty heavy and are made of composite wood. There are two pre-drilled holes on the back of each shelf. 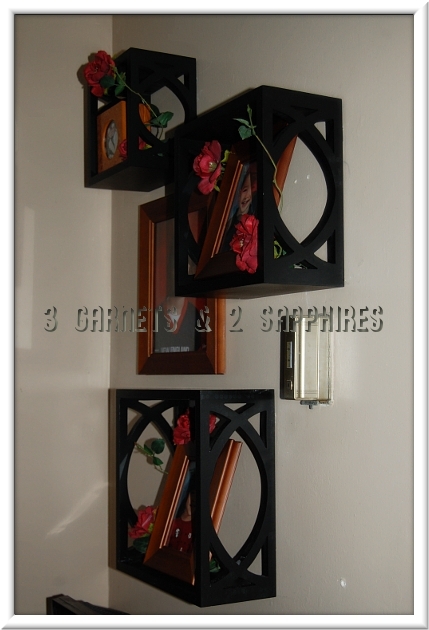 I think these Lattice Cube Shelves would work best with a mission style or modern decor, but they can be transformed to fit any decor by adding your own special touches, such as artificial flowers, garlands, ribbon, etc . . .
To learn more about Kirkland's affordable home furnishings, visit Kirklands.com and Kirkland's on Facebook. 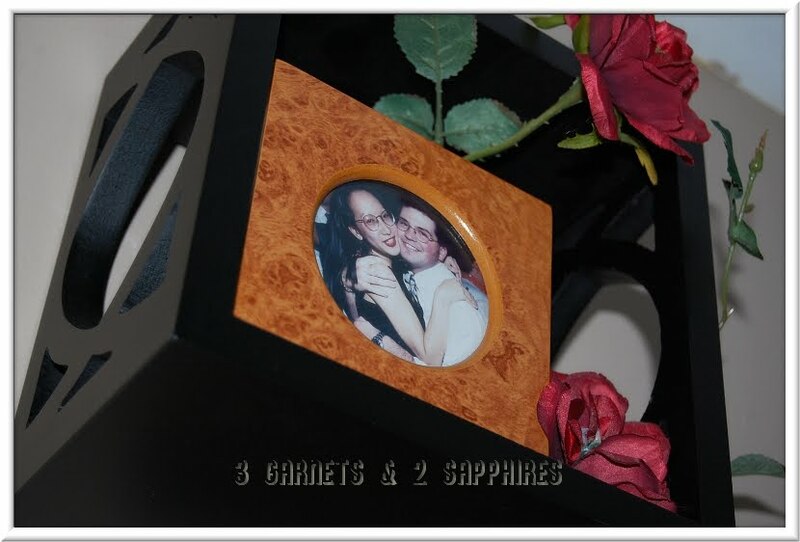 To learn more about the designers behind these products, visit MyKirklands.com. Thank you to Kirkland's for providing a complimentary product sample for us to base this review upon and for providing a second product for our contest prize. One lucky reader will receive a Set of 3 Lattice Cube Shelves from Kirkland's. This giveaway is open to Continental U.S. entries only. You do not need to be a blogger to enter, but you must have a valid email address and be age 18 years or older. If you enter anonymously and do not include a valid email address in your comment entries, I will not be able to notify you should you win this random drawing. Click here for official contest rules. Browse the selection of home decor offered by Kirkland's. Then leave a comment telling me the name of one item you would love to display in your home. You MUST do this to be eligible to win this contest. 3) For 10 extra entries, join the Kirkland's Email List to receive exclusive coupons and more. Then come back here and leave TEN separate comments telling me you did. 5) For 1 extra entry, "Like" Kirkland's on Facebook. Then leave a separate comment with the link to your Facebook profile. This contest will be closed on Monday, September 5th, 2011 at 11:59pm EST. A random number drawing will be held shortly after. The winner will be announced here and will be contact via email or through their blog. If the winner does not respond within 48 hours, a new number will be drawn.